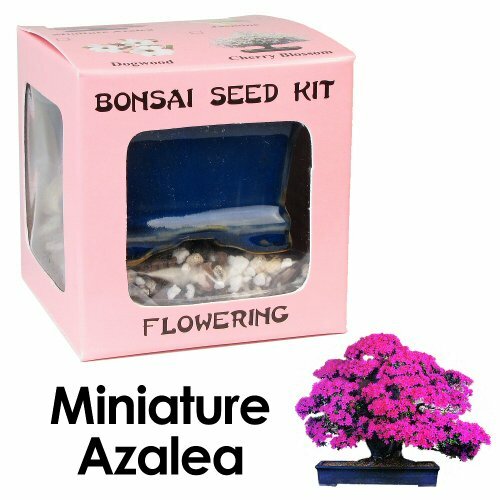 Grow Bonsai Trees from seed with this Complete Miniature Azalea Bonsai Seed Kit. Perfect for children or any individual who wants to get their hands dirty and learn the hobby of Bonsai. The seeds in this kit will germinate and continue to grow for many years. Kit includes Miniature Azalea Bonsai Seeds, Ceramic Container, Bonsai Potting Mix, Pebbles, and Instruction Guide. Miniature Azalea (Azalea schlippenbachi). Azalea Bonsai produce beautiful pink flowers with a single flower at the end of each branch. Azaleas should be kept outdoors and sheltered from direct sunlight and strong wind. Azaleas can be shaped into just about any Bonsai style. Pruning Azalea Bonsai should be done just after flowering. Remove any dead flowers and clip the branches according to your imagination. Size, shape, and color of ceramic bonsai pot may vary.